She said lots of inquiries are coming in by phone and social media, and some of the callers are not used to asking for food. 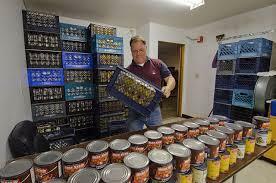 Even before the shutdown, about 40 percent of food pantries across Kentucky were unable to meet community demand. But Sandberg encourages federal government employees impacted by the shutdown to go to food pantries because local communities step up in times of need with donations and food drives. So far, there’s no sign of when the next paycheck will come for federal goverment employees. A spokesman for the American Federation of Government Employees said the union has 972 members in Kentucky impacted by the shutdown, including employees of the Bureau of Prisons, Equal Employment Opportunity Commission, and the Census Bureau. The number of federal employees in Kentucky actually impacted by the shutdown is estimated to be close to 2,000, because federal government workers are not required to join the union, and about half of those in the Bluegrass State are not union members. The partial government shutdown is having an impact on some outdoor enthusiasts in the southern Kentucky region. The Green River Ferry at Mammoth Cave National Park is closed and that’s affecting some hikers and cyclists. The visitors center at Mammoth Cave National Park is closed and no tours are being held as a result of the government shutdown, but the hiking and bicycling trails at the park are still open the public. Eddie Bruner is director of Cave Country Trails, a group that promotes cycling, horseback riding, canoeing and hiking in the cave area of southern Kentucky.